I was lucky enough to spend a few days this week at the cottage my parents are renting. We had a delightful time. Mornings were lazy and, when we finally dragged ourselves out of bed, I cooked brunch. That’s bacon, eggs over easy, apple slices, and whole wheat toast — made of store-bought bread, which is unlike me. I decided I needed to remedy that situation and so after we cleaned up from brunch, I started to throw together some homemade loaves. I didn’t have access to the internet or my plethora of cookbooks, so I used the White Bread recipe from page 596 of the Joy of Cooking (Rombauer & Becker, 2006 edition). (Actually, I used the app since it has the whole cookbook on my phone and doesn’t need Internet access, but it’s the same recipe either way.) In the recipe I substituted olive oil in the same quantities for the lard and butter, which has worked in the past and did so this time as well. 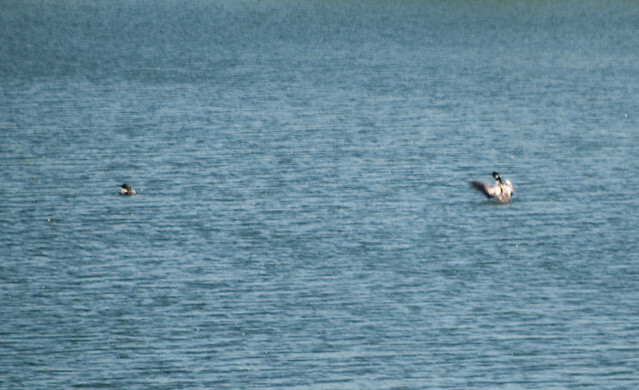 That’s a horrible picture of the loons on the lake because my zoom lens isn’t spectacular. You’d think it’d be easier to get a photo of a bird that can grow to almost a meter long, but these ones had no interest in coming any closer. The loons were calling away while I was kneading my dough. I find it a very soothing sound, but I grew up with it. 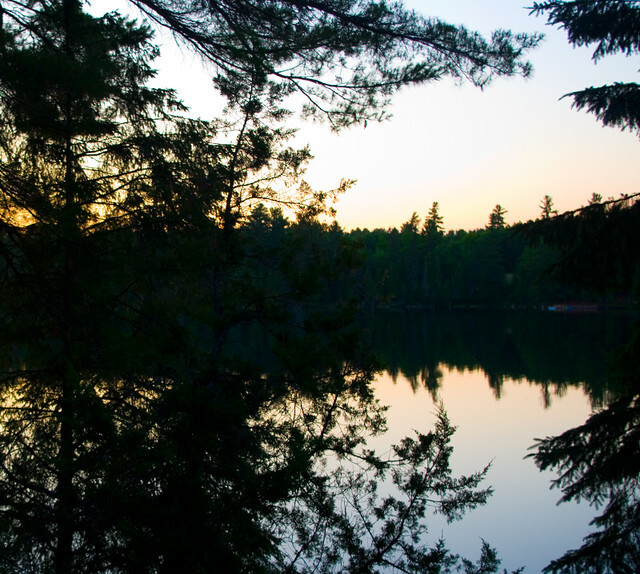 In understand that to some people a loon call, especially their mournful, echoing night call, can be kind of creepy. My father likes to tell us the story of going camping and being approached by frightened tourists in the next site over who were sure they were hearing the sobbing souls of the damned. Followed by a drive out to the ice cream parlour for a cool treat and some reading time. It wasn’t too long before it was time to go back to the cottage to bake the bread, and then to make dinner. 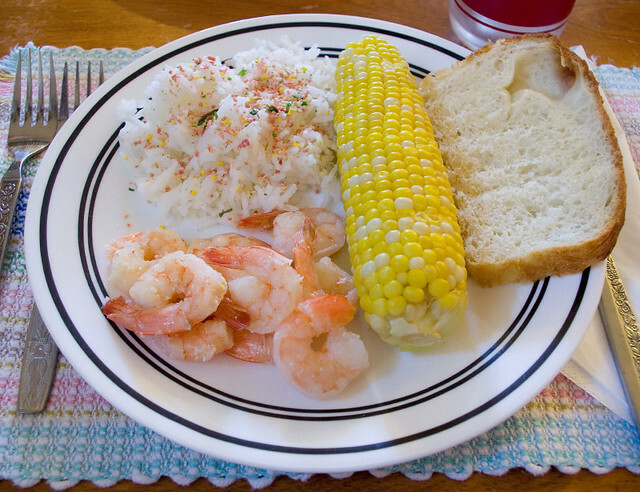 I made shrimp with garlic butter, jasmine rice with furikake, corn on the cob, and of course the freshly-baked bread. Dessert was cherry drop biscuits baked the day before using the Rolled Biscuits recipe from page 638 of the Joy of Cooking (or the app again). 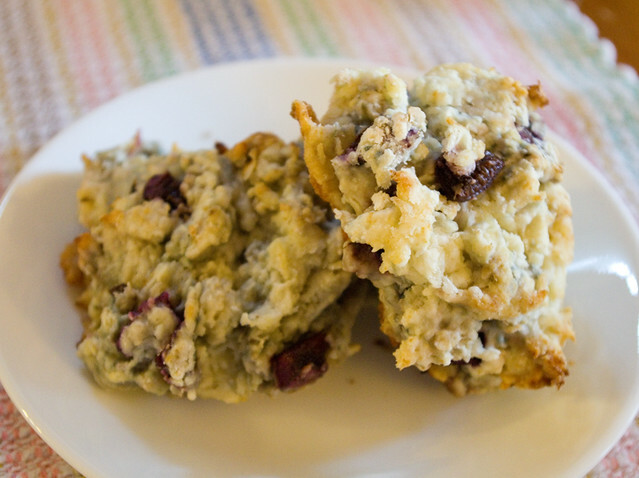 I added a bunch of pitted, quartered cherries stirred into the batter and a sprinkle of sugar on the top of each biscuit before baking. I got lazy and just made them drop biscuits instead of rolled, and they turned out fine that way. 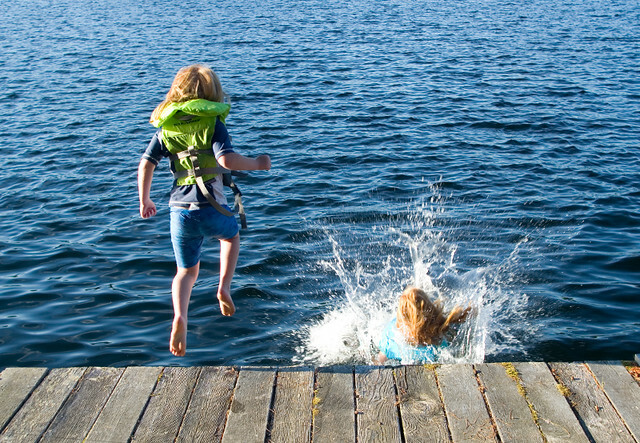 Then it was time for one last dip in the lake, followed swiftly by bedtime for the kiddos, who had had a long, fun day. I took the opportunity to bring my glass of maple Sortilège on the rocks out to the screened-in sun room (the mosquitoes are much too bad in the evening to simply sit outside) so that I could watch the sun set. It wasn’t the most spectacular that I’ve viewed from this spot, seeing as there wasn’t a cloud in sight, but I think I can live with that. 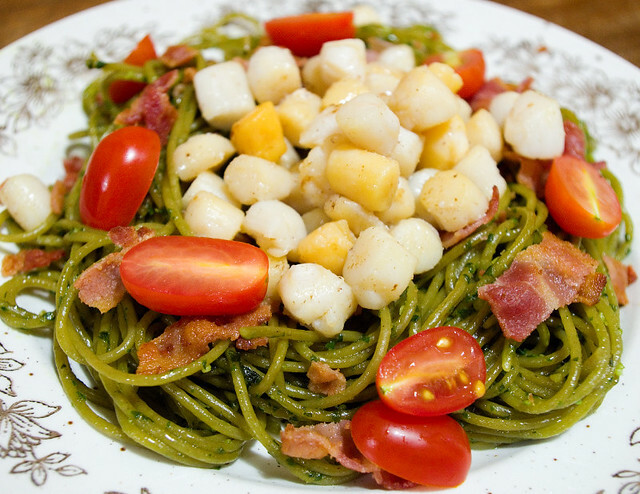 I wasn’t feeling super-adventurous yesterday, so I stuck with a few recipes that I knew generally go well. 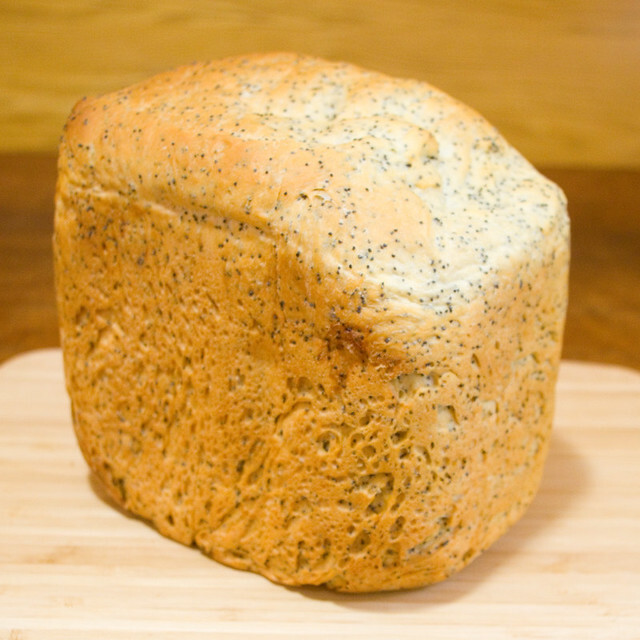 First was a poppy seed loaf (Bread Machine: How to Prepare and Bake the Perfect Loaf (Jennie Shapter, 2002), page 138). Much to my surprise, my husband, who generally doesn’t cook much, actually is getting into this whole breadmaker thing; he whipped up this loaf a couple of times before I tried the recipe myself. This loaf is light and fluffy, but the seeds add a lovely crunch, and the crust is golden and crispy even when cooked on the “light crust” setting. One thing we’ve learned about cooking from this book is that my bread machine (the Black & Decker All-In-One Deluxe Horizontal Breadmaker) is really a medium-sized machine according to this book, while I had thought it was a large. A medium-sized machine is defined as ones that “make loaves using 450-500g/1lb 2oz/4-4 1/2 cups of flour” (page 7, Bread Machine). Now, you see, I would have known that if I’d been paying enough attention, but for some reason I assumed my machine had a larger capacity than it does, and I directed my husband to make the largest version of the white bread recipe (page 66) for his first try at breadmaker baking. Well, while the bread was rising it expanded so much that it pushed the lid open and the dough started oozing out of the bread machine. My husband punched the dough down and cut some of it out, and that seemed to be the solution until the start of the baking cycle, when the dough pushed the lid open again once the temperature increased. At that point we were worried that the dough might continue to grow and slide down the side of the pan and onto the heating element, possibly resulting in a fire. So my husband rescued the dough and I prepped two small loaf pans, and we finished up the bread in the oven. Because the bread had started to cook a little in the breadmaker, the consistency was a little off, but it was still edible (and a darn sight better than some store-bought bread I have tried). Since this fun episode, we’ve been using the recipe for a medium-sized bread machine and we have yet to have any problems. Yesterday I also went back to my old standby of udon noodle soup for dinner, which always uses the same technique but ends up slightly different every time. I used homemade chicken broth seasoned with a dash of soy sauce and a tiny bit of dashi granules. 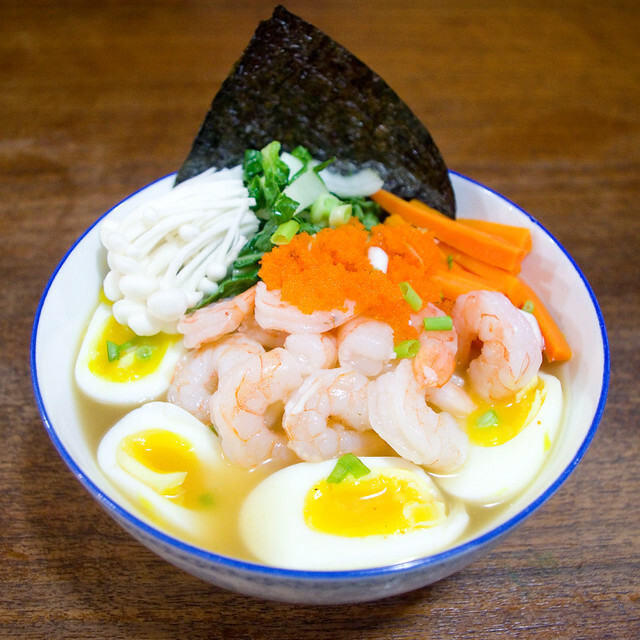 The toppings were soft-boiled egg, precooked shrimp, raw enoki mushrooms, steamed bok choy, steamed carrots, nori, seasoned capelin caviar, and raw chopped green onions. The rest of my family also had fish balls in their soup, but I’m not a huge fan. I’m taking a break today from ComicCon recap to post a recipe that a few people have asked for: my slow cooker clam chowder. I developed this recipe for two reasons: 1) I love dairy, but it doesn’t love me back, so if I want clam chowder I have to make it for myself with a dairy substitute, and 2) I had packages of frozen clams in my freezer that I’d bought on sale and I had no idea what I wanted to do with them. I Googled for ideas, and for the most part the consensus seemed to be that frozen clams are gross and tough, so don’t buy them in the first place. Well, in the past I’ve learned that simmering tough cuts of meat in liquid for a really long time can make just about anything palatable, and that technique works well with cheap frozen clams. As a bonus, all of the ingredients can be prepped the night before, and then most of them are thrown into the slow cooker as you get ready for work. This chowder really only needs attention in the last hour or so, and even then not much. A note regarding dietary requirements: I make my clam chowder dairy-free using almond milk, and nobody can tell the difference. If you’re allergic to nuts, try soy milk or rice milk instead. If you prefer dairy, use 2% milk. Also, clam chowder can’t really be made vegetarian or vegan — all you’d be left with is potato soup (which can be good, but is no longer clam chowder). However, if you don’t eat pork, turkey bacon may be substituted, although it will change the flavour somewhat. 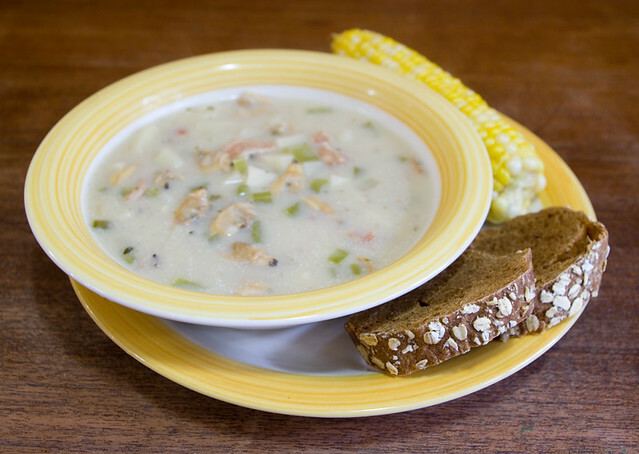 Slow cooker clam chowder, served here with microwave oatmeal wheat bread and corn on the cob. Place cooked bacon on a plate that is covered with a few pieces of paper towel; dab the bacon lightly to remove excess grease. 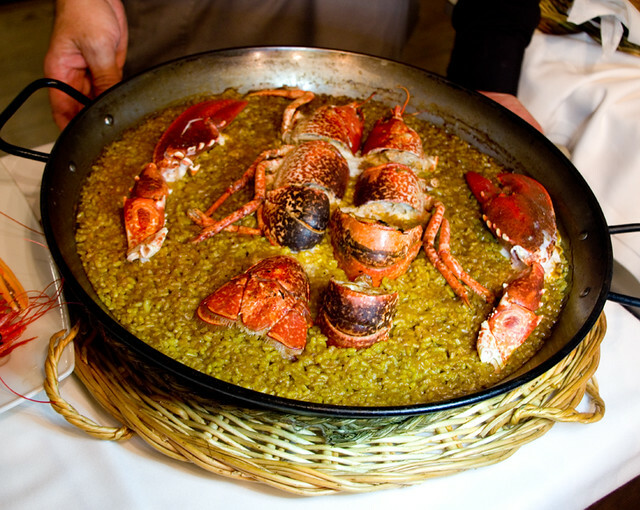 Cook in slow cooker for 7hrs on high, until potatoes are tender**. Stir in the milk and corn starch into the mixture in the slow cooker. Cook until it reaches the desired thickness, about 1 additional hour. 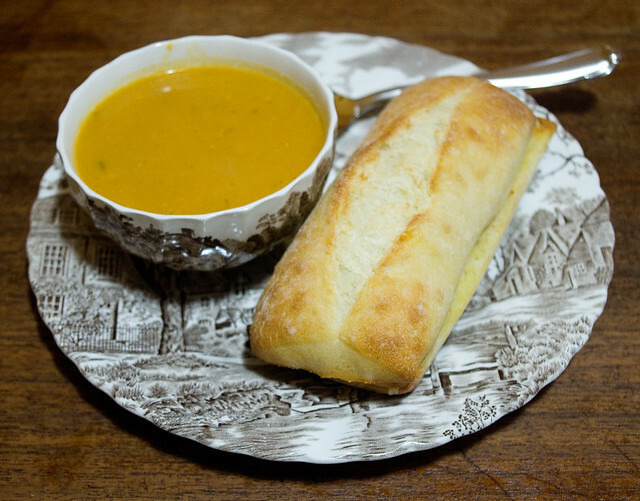 I serve this soup immediately and freeze the leftovers; it also refrigerates well. 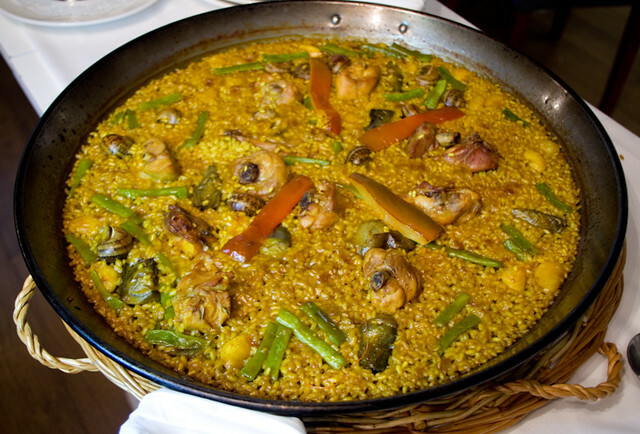 If you are planning on serving this at a gathering, it can be prepared in advance and reheated immediately prior to serving. 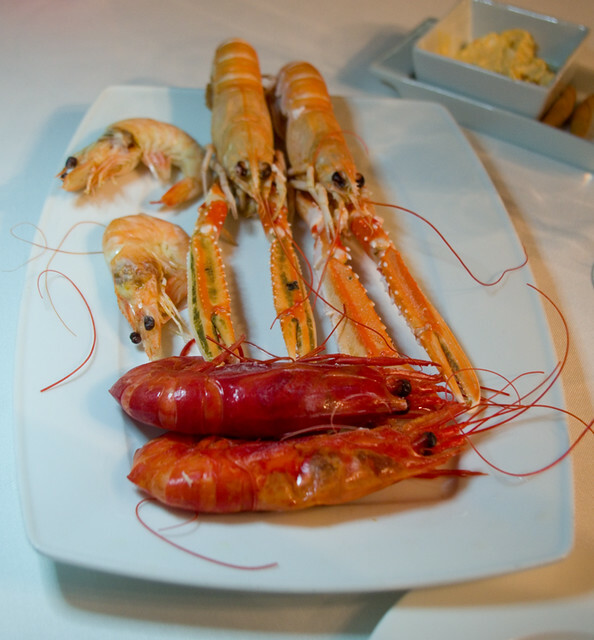 *1/2 tsp dried thyme may be substituted for fresh. **If you have an older slow cooker, you may need to adjust cooking times, as older slow cookers (pre-1980 or so) do not get as hot. If you’ve cooked it for the required time and the potatoes still aren’t tender, the recipe may be finished on the stove, being careful not to boil or scald the liquid.